1910. By Ancient US-Navy saylor (uploaded by W.wolny) (US Navy Photo #: NH 77601) [Public domain], via Wikimedia Commons. 1910. Article in The Engineer. Eugene Burton Ely (October 21, 1886 - October 19, 1911) was an aviation pioneer, credited with the first shipboard aircraft take off and landing. Ely was born in Williamsburg, Iowa and raised in Davenport, Iowa. He attended Iowa State University, graduating in 1904. Following graduation, he moved to San Francisco, California, where he was active in the early days of the sales and racing of automobiles. He married Mabel Hall and they relocated to Portland, Oregon in early 1910, where he got a job as a salesman, working for E. Henry Wemme. Soon after, Wemme purchased a Glenn Curtiss first four-cylinder biplanes and acquired the franchise for the Pacific Northwest. Wemme was unable to fly the Curtiss biplane, but Ely, believing that flying was as easy as driving a car, offered to fly it. He ended up crashing it instead, and feeling responsible, bought the wreck from Wemme. Within a few months he had repaired the aircraft and learned to fly. He flew it extensively in the Portland area, then headed to Winnipeg to participate in an exhibition, moving to Minneapolis, Minnesota in June 1910, where he met Curtiss and started working for him. Ely received federal pilot's license #17 on 5 October 1910. In October, Ely and Curtiss met Captain Washington Chambers, USN, who had been appointed by George von Lengerke Meyer, the Secretary of the Navy, to investigate military uses for aviation within the Navy. This led to two experiments. On November 14, 1910, Ely took off in a Curtiss pusher from a temporary platform erected over the bow of the light cruiser USS Birmingham. The aeroplane plunged downward as soon as it cleared the 83-foot platform runway; and the aircraft wheels dipped into the water before rising. Ely's goggles were covered with spray, and the aviator promptly landed on a beach rather than circling the harbor and landing at the Norfolk Navy Yard as planned. Following this flight, Ely was made a lieutenant in the California National Guard to qualify for a $500 prize offered to the first reservist to make such a flight. 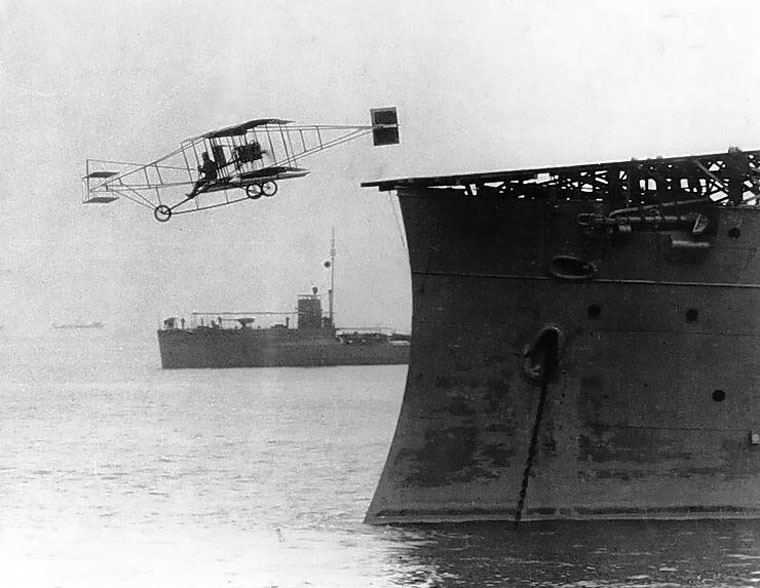 Two months later, on January 18, 1911, Ely landed his Curtiss pusher airplane on a platform on the armored cruiser USS Pennsylvania anchored in San Francisco Bay, using the first ever tailhook system, designed and built by circus performer and aviator Hugh Robinson. Ely told a reporter: "It was easy enough. I think the trick could be successfully turned nine times out of ten." Ely communicated with the United States Navy requesting employment, but United States naval aviation was not yet organized. Ely continued flying in exhibitions while Captain Chambers promised to "keep him in mind" if Navy flying stations were created. Captain Chambers advised Ely to cut out the sensational features for his safety and the sake of aviation. When asked about retiring, The Des Moines Register quoted Ely as replying: "I guess I will be like the rest of them, keep at it until I am killed." On October 19, 1911, while flying at an exhibition in Macon, Georgia, his plane was late pulling out of a dive and crashed. Ely jumped clear of the wrecked aircraft, but his neck was broken, and he died a few minutes later. His body was returned to his birthplace for burial. In 1933, he was awarded the Distinguished Flying Cross posthumously by President Franklin D. Roosevelt, in recognition of his contribution to naval aviation. An exhibit of retired naval aircraft at Naval Air Station Norfolk in Virginia bears Ely's name, and a granite historical marker in Newport News, Virginia, overlooks the waters where Ely made his historic flight in 1910 and recalls his contribution to military aviation, naval in particular. This page was last edited on 20 August 2018, at 11:38.